Dziga Vertov is one of the most revered names in Soviet filmmaking. The ways in which he married radical politics to radical film form in films such as the screen magazine Kino-Pravda, Man with a Movie Camera, A Sixth of the World and Three Songs of Lenin, and in his theoretical understanding of film, especially his concept of the ‘kino-eye’ (“I am an eye. I am a mechanical eye”) argued for film as the vital medium at the time that a new form of society was emerging. Vertov demanded that film showed the truth. 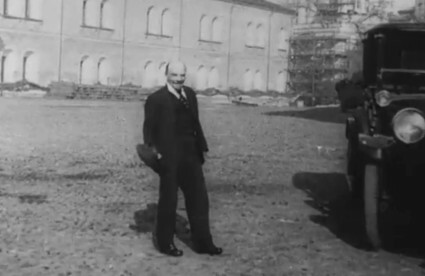 In technique this meant both trusting and curiously distrusting the camera’s propensity for capturing reality, as he employed exuberant montage (especially in Kino-Pravda) to reveal supposed greater truths by stirring the passions and stimulating the ideas of the observer. Vertov’s first films were not so radical. His film career began as a writer and occasional director for the newsreel Kinonedelja (Cinema Weekly), produced by the Moscow Film Committee of the People’s Commissariat of Enlightenment. 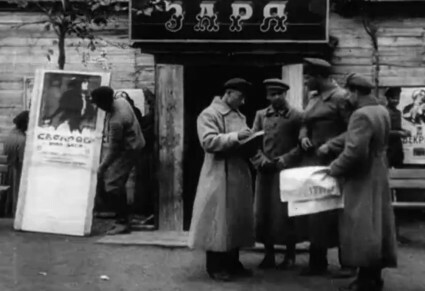 This newsreel ran for forty-three issues between May 1918 and June 1919, documenting daily life in Russia in the months following the revolution of October 1917. Remarkably fourteen issues from the series survive, discovered in Sweden and now held by the Austrian Film Museum which has digitised and made twelve of the fourteen available online. Kinonedelja has nothing like the exuberant and confrontational experiments in film reportage Vertov develped for Kino-Pravda over 1922-25. It is, instead, fascinatingly mundane. It is newsreel footage much like newsreels were being produced elsewhere around the world, basic in construction, reporting on matters of passing, local interest, in form more passive than manipulative. Kinonedelja certainly has its propagandist edge, and is loaded with the excitement of social and political change, and some propagandist language (“Soviet border guards congratulate their German comrades for liberating themselves from the bonds of monarchical slavery”). But it mixes this rather charmingly with the everyday, either reports on the ordinary (buildings being constructed, several reports on snow, a children’s festival) or by revealing the ordinary carrying on in the background. The human eye will always see more of what is going on than the camera eye, for all Vertov’s theorising. 1. The Peoples’ Commissar for Food Rationing, Comrade Cjurupa. / The Peoples’ Commissar for Rationing in the Southern territories, Comrade Šljapnikov. / Head of the Army Rationing Committee, Zusmanovič. 2. Intelligensia working on farms behind the Butyrsk construction site. / Planting cabbage. / Townspeople plant potatoes in a large field. 3. Lunch for the unemployed in exchange for labor. / A meal costs one ruble and ten kopecks. 4. I.G. Cereteli arrives in Moscow in the capacity of the delegate from the Caucasus. 5. In Vladivostok. Commander of the counter-revolutionary forces in Siberia, Admiral Kolčak. 6. In Moscow. June 8. Wounded Russian prisoners of war return from German captivity. / Disembarkation. / Loading the wounded into ambulances. / Wooden shoes for our prisoners in Germany. / Armbands on tunics and greatcoats testify to the repression suffered by Russian officers of the 10th division in the Hannover region. / Head commander of the Soviet Army in the Northern Caucasus, Comrade Avtonomov. 7. In Petrograd. The Revolutionary Tribunal. Murder trial for O. Kokošin und A. Šingarev. / The accused, Kulikov and Basov. 8. The new Brjansk Station in Moscow. / The central platform for passengers. 9. A children’s festival held by the Peasant Soviet in the village of Mitišča. / Who is stronger? Much of Kinonedelja is given over to promoting the revolution and to the ongoing civil war. There are calls to arms, scenes of medical care, refugees, prisoners of war, agit trains, funerals. Little of it demonstrates the more manipulative arts of cinema (and where the newsreel does so it is clumsy, as in a story showing a queue of men keen to join the Red forces moving with comical swiftness inside an enlisting station, being inspected within, and then moving just as rapidly out of the building). It is almost guileless. Vertov would go on to greater things – in terms of film art – but for a motion picture portrait of the Soviet Union coming into being and as it was reported to its people at the time we are most fortunate to have the plain and revealing Kinonedelja. The video are presented silently, and the quality of the digitisations is high. It is the first time the Austria Film Museum has presented archive films online (which is a little startling to learn in this day and age) and one looks forward to more of similar high quality in presentation. However, while it may have been been slow in putting up films online, the Museum has been exemplary in digitising and making available its extensive collection of primary documentation on Dziga Vertov. 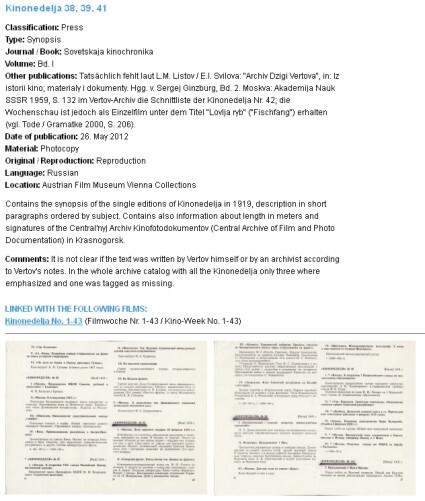 The site provides an overview of the collection and a database, which has content descriptions in their original language plus German and English (most are in English as yet, but translations are promised). So, for example, you can find 368 digitised documents on Man with a Movie Camera, 159 on Three Songs of Lenin, 72 on A Sixth Part of the World and 23 on Kinonedelja itself, with around 1,900 documents all told. They includes newspaper articles, photographs, posters, advertisements, frame enlargements, notes, letters and montage lists. All is clearly catalogued, and each document usefully crossed-linked to the relevant film, encouraging further browsing. You can also search by language, type of document, name of journal etc. There is a book guide to the collection available, Dziga Vertov: The Vertov Collection at the Austrian Film Museum. More information on Kinonedelja and Vertov’s later film work can be found in the 2004 Pordenone silent film festival catalogue (when the festival ran a major retrospective of Vertov’s films). There is a useful essay on Vertov’s career and influence on Senses of Cinema.